When you’re a kid, The Park is the highlight of your day. It’s the place you know before you go to school, before summer camp, before gadgets and screen time vie for your attention. The Park may not be much — a square of lawn for playing tag and chasing squirrels, a few swings and maybe a slide, an encircling sidewalk for riding your bike — but when you’re a kid, it’s probably the biggest green space you know, where the trees tower as high as your imagination, where you can run and ride free. We have long known that we need these green spaces even after we grow up. Our cities know, too, and that’s why places like Central Park in New York, Lincoln Park in Chicago, Piedmont Park in Atlanta, and Golden Gate Park in San Francisco have continued to flourish even while the cities grew tall around them. That’s why, a few years back, Louisville, Kentucky decided an urban greenspace — a really great park — would be a good addition to the city best known for bringing us fried chicken and the Derby. But I guess in Louisville, you go big or go home, because they are not just building a park, they are building The Parklands, a world class system with four major parks offering the chance to walk, hike, bike, canoe, fish, picnic, play, and just generally have fun. Running through the whole thing will be the Louisville Loop, a planned 100-mile trail that will encircle the city and connect to other destinations. 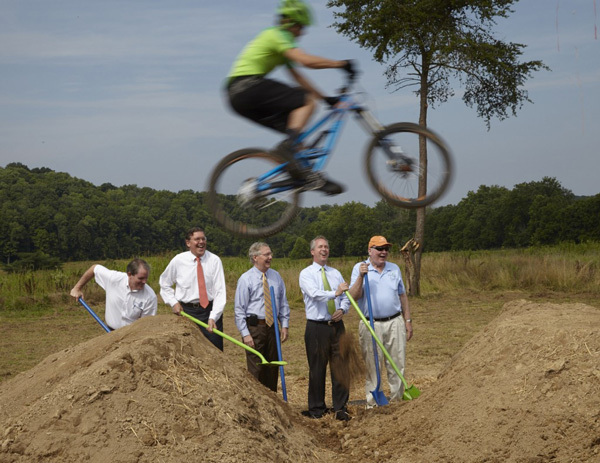 Of course, no major park is complete without some fun places to ride your bike, so when 21st Century Parks, the non-profit that is developing and running the Parklands, requested funding for a bike trail, we jumped in with two wheels. They finished the Coppiced Woods Trail last November and it’s part of the 7+ miles of pathway that run through Beckley Creek Park, the first of The Parklands parks to be completed. We are proud and delighted to be part of this impressive project and really happy that we could help make bicycling one of the core attractions. Last week, Mayor Greg Fischer and Senator Mitch McConnell joined local dignitaries and supporters to break ground on the final and largest phase of the The Parklands, Turkey Run Park. We invited some of the people who help make bicycling in Louisville great to attend the event: Greg Scheller of Sheller’s Fitness & Cycling, and Carson and Alison Torpey from Bardstown Road Bicycle Company. Local businesses like theirs will benefit from the park system as it bolsters tourism and recreation and creates many new jobs. 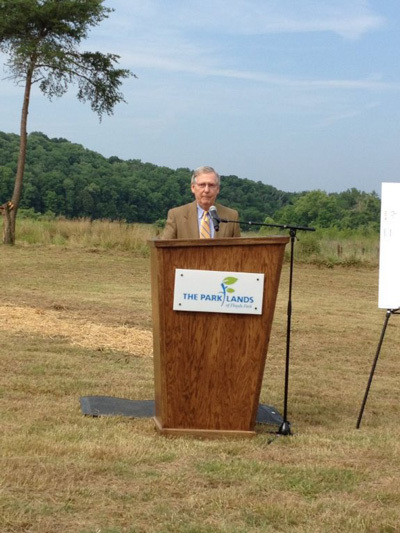 Senator Mitch McConnell?a key player in making The Parklands a reality?speaks at the opening. Most impressive was the enormous work that went into making the vision of this park a reality. Private and corporate backers raised more than $60 million to leverage the $38 million in federal funding secured by Senator McConnell. This money, along with funds contributed by Louisville Metro and the Commonwealth of Kentucky, allowed 21st Century Parks to buy 80 pieces of property and begin building a truly amazing outdoor recreation facility. Whew. And I thought I had a busy week. Congratulations to Louisville, for adding The Parklands at Floyds Fork to the list of great urban spaces in our country. I can’t wait to go visit with my daughters and take a spin along the creek. Whether as a kid or an adult, we need these places. We need the chance to run and ride free.